In the wake of a cold front that passed through earlier this morning, temperatures will only reach the upper 60s and lower 70s this afternoon, according to the National Weather Service in Brownsville. Breezy conditions are possible during the morning hours, and their is a slight chance for rain near the coast. The rain and clouds, however, are expected to clear throughout the day. 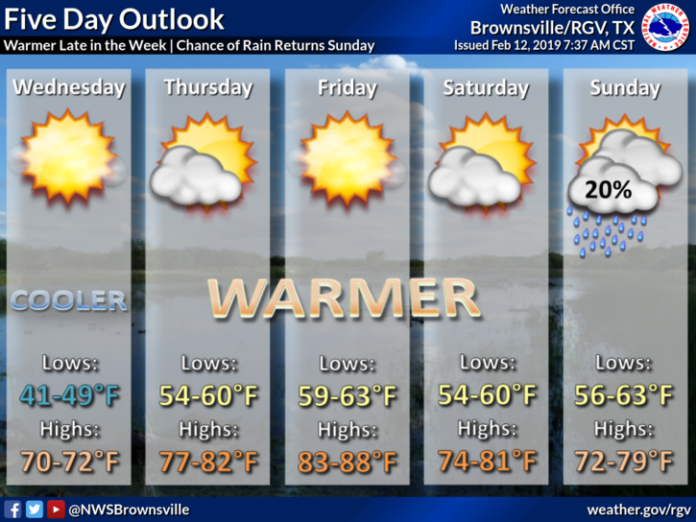 Highs in the Valley include Brownsville at 71 and McAllen at 72. Looking ahead, Wednesday morning temperatures will be in the 40s before a warming trend begins for the rest of the workweek. Temperatures Thursday through Saturday may be in the 80s. On Friday, there is a possibility of upper 80s in some areas.